(LCA). 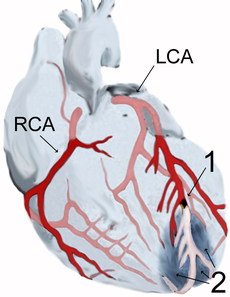 In the diagram, RCA is the right coronary artery. TotipotentRX Corporation and ThermoGenesis Corp. reported yesterday at the annual meeting of the American Association of Blood Banks in Denver, Colorado, a study confirming TotipotentRX's acute myocardial infarction ("AMI") combination product utilizing ThermoGenesis' point-of-care cell processing technology for an autologous bone marrow derived stem cell therapy can be delivered safely in 60 minutes. Mr. Ken Harris, Study Director and Chief Executive Officer of TotipotentRX, presented a case study and physician feedback confirming that the Company's Acute Myocardial Infarction Rapid Stem Cell Therapy (AMIRST) protocol utilizing autologous bone marrow derived stem cells achieved its primary safety and secondary efficacy endpoints by improving the patient's Left Ventricular Ejection Fraction (LVEF) from 35% to 60.3% in 24 months while preventing further infarct scarring and undesirable remodeling. Low LVEF and heart remodeling are two key contributors in AMI patients advancing to heart failure. 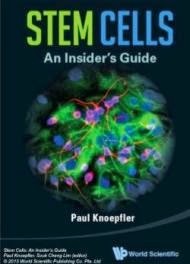 Dr. Ashok Seth, Chairman - Cardiac Sciences, and Dr. Vinay Sanghi, both of Fortis Healthcare, conducted the clinical case study which shows the AMIRST treatment safely delivered to a single male patient an effective dose of autologous selected stem cells in a single intracoronary heart catheterization procedure. The Company believes this is the first integrated combination product treatment, consisting of a combination of devices and biologics, to be evaluated in a larger follow-up study. "Conducting a fully-integrated point-of-care treatment on a patient with an acute ST-elevated myocardial infarction using the AMIRST protocol was straightforward and very exciting as a practicing interventional cardiologist. The safety and positive clinical benefits demonstrated in this single patient case study are very encouraging as we begin the double-blinded AMIRST study which should provide statistically significant insights" said Dr. Vinay Sanghi, Clinical Investigator and treating physician on this case. "this case study affirmed that our integrated combination product has appropriately considered the essential devices, diagnostics, cell formulation, and directions for use ensuring the AMIRST treatment meets the objectives of providing a safe, effective, rapid, bedside therapy for treating low ejection fraction after a primary myocardial infarction. We are enthusiastically looking forward to the randomized placebo controlled Phase Ib study in the coming few months. We envision this product, if approved, will improve the quality of life and mortality rates of low LVEF patients." said Mr. Harris. "We are very pleased with the initial results of this study using our combination product, in addition to the positive safety and efficacy data, we are particularly encouraged by the potential durability of the treatment, given this patient's LVEF exceeded 60% two years post treatment. Based upon the AMI population and those that meet the criteria for an approved AMIRST therapy, we estimate the addressable U.S. market for our combination product to exceed $500 million per year." said Mr. Matthew Plavan, Chief Executive Officer of ThermoGenesis. This study will be advanced to a double blinded placebo-controlled randomized Phase Ib clinical trial of 30 patients (NCT01536106) in the first quarter of 2014.